The Lyon's Tale: We Interrupt This Bloggy Break . . . I've picked a title for the book. I have a cover designed by my good friend Crystal Leichty, graphic designer extraordinaire, and I've written, proofed, and uploaded the puppy to the publishing company. If all goes well, I should have actual copies to put in the bookstore at the LDStorymakers Conference this weekend. That also means it'll be available for order online in just a few days. Can I hear a woot, woot! I sort of have two title winners. Lara from Overstuffed was the first to suggest using "Word Nerd" in the title. I decided that was a must, since a lot of people know me by that lovely term. So that's in the subtitle. Lara gets a copy. The main title was suggested by Mel Henderson. Also known as my cool big sister. She got on a real title-suggestion roll there, shooting dozens into my in-box. She'll get a copy too. The title is . . . (drum roll, please) . . . I'll let my readers know when and how to order it when it's officially available. I plan to do new editions in future years, expanding it as I people shoot me more grammar, usage, and punctuation questions. For now, even though the first edition is by no means exhaustive, it has the most common errors I see and the questions I've been asked the most. Quick reminder: Don't forget to enter the drawing for the two books on my last post! Now, back to my bloggy break (I've missed you guys, and I'll miss you even more!). But I've got oodles to get done before the LDStorymakers conference this weekend, and I certainly won't have time to blog during the conference. That means I'll see you next week! That is one BRILLIANT cover! Congratulations on the book, Annette. I have the strong feeling it could be a best seller. I love the title (and subtitle) of your new book! How exciting. You have a lot going on right now! AWESOME! I would totally LOVE this book! Have a beautiful and sunny day! Yay! I'll be buying a copy at the conference this weekend! Fabulous title, fabulous cover, and I can't wait to get my hands on a copy! Oh my gosh! I'm so excited! I know I will love this book! And the cover is awesome! I love it. Congrats, and good luck with Storymakers. I love it!! that is a prefect cover, and the title is amazing. So excited for you - it looks fabulous! See you in a few days! That is exciting! I really love the title and the cover! As the reigning GRAMMAR QUEEN amongst my friends and family, I have to tell you I LOVE THIS!!! Thanks for stopping by my blog and entering the giveaway today...your questions are great!! Congratulations! That's a great title! You've read my blog- you KNOW I need this book! LOL! Great title and perfect cover! See you next week, Word Nerd. This should be required reading for anyone starting a blog. I love the cover and name! That's PERFECT. Brilliant. I love it! Super! I'll definitely buy a copy. The cover is awesome! See you at the conference. How fun! 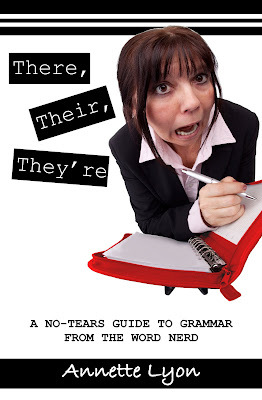 I think it is totally cool that you are publishing a grammar book! I love it, and I desperately need it. It will have a place of honor on my desk. Sorry to whine but I've TOTALLY MISSED YOU ANNETTE! Congrats on the fabulous book cover and the wonderful title! I can't wait to get my hands on it at Storymakers! Great title, great cover. Congrats!!! Hope you have a very productive week! It looks great. Congrats on getting it all done. I be that's a relief! Wow. That was fast. The book I mean, not the blog break. LOVE it! You busy, busy gal! I can't wait to read this one! Fantastic! Your cover and title are genius. Go ahead and autograph a book for me now. It's coming back home with me for sure. I am in great need of your book, so I hope that they will be available at the conference. See you there!! I love that title! It's perfect! Congrats on your book! Looks like a winner! Stopped in from MMB. Have a great day! Yeah! Good for you Annette. Where can I get a copy? Who was the publisher?